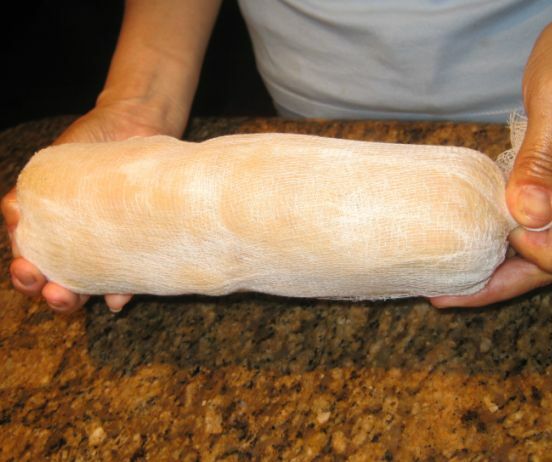 All of us love Pan-seared Foie Gras but this time I wanted to do served it cold, so the only way I know how, is to make a Foie Gras au Torchon (Foie Gras in towel). 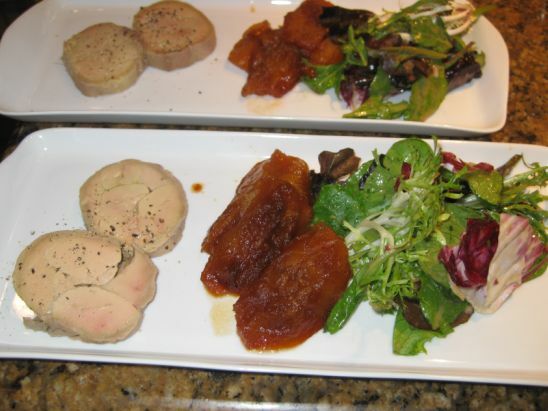 The torchon is probably the best way to serve Foie Gras cold. According to Thomas Keller from the French Laundry this dish is almost an overindulgence. 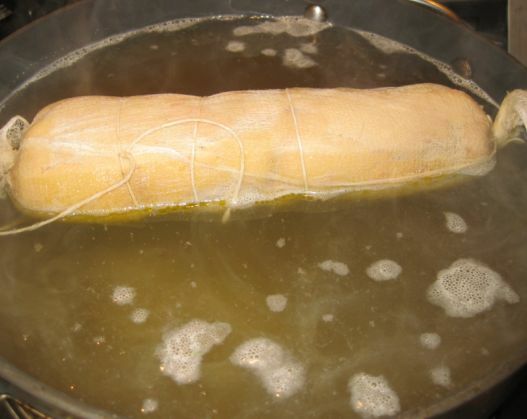 Basically, the torchon is formed by placing the Foie Gras on cheesecloth and wrapping it into a tight cylinder (like a sausage), then poaching it for less than 2 minutes, 90 seconds to be exact. The torchon is not difficult to make but it must be prepared over a four day period! The good thing about the torchon is once it is made it can be refrigerated for up to one week. Good to know but it does not look like I am going to have any leftovers anyway. 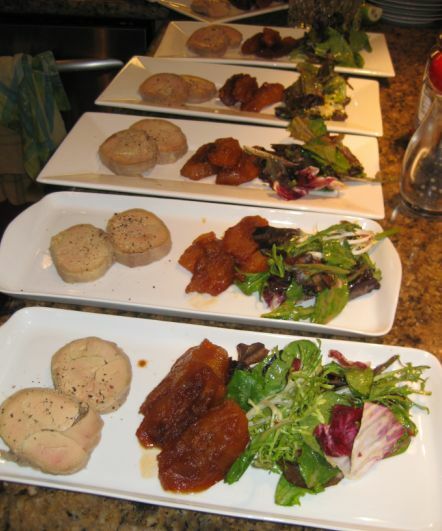 I served the Foie Gras au torchon with caramelized apples and a mixed green salad with honey vinaigrette. Here I am plating for the group. I served the Foie gras in rectangular plate for 2 people. Close look at the Foie Gras! 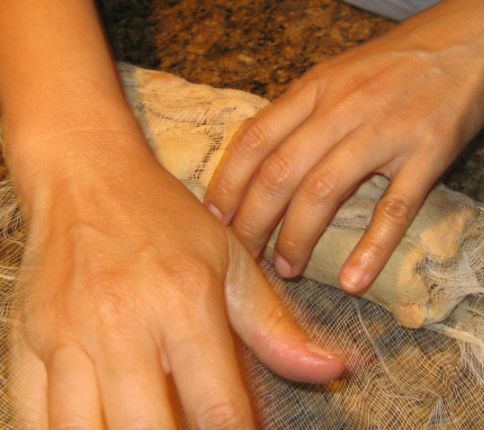 Think of the Foie Gras as Play-Doh, no matter how much you cut and scrape the inside, you can always be able to shape it back in a round cylinder by pulling and shaping/molding the torchon. 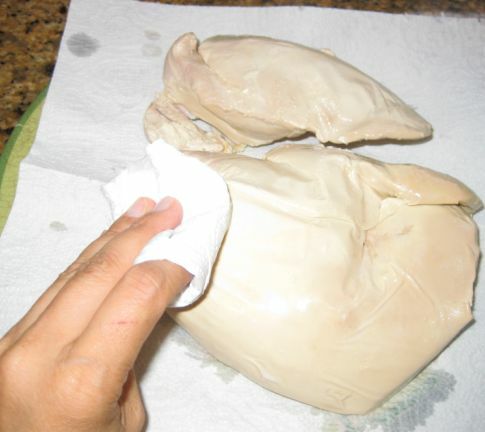 Day 2: The Foie Gras is remove from the milk, rinsing, and drying out the Foie Gras with a paper towel. The lobes are taken apart and the primary vein is located and pulled away. This is a tricky and lengthy task. 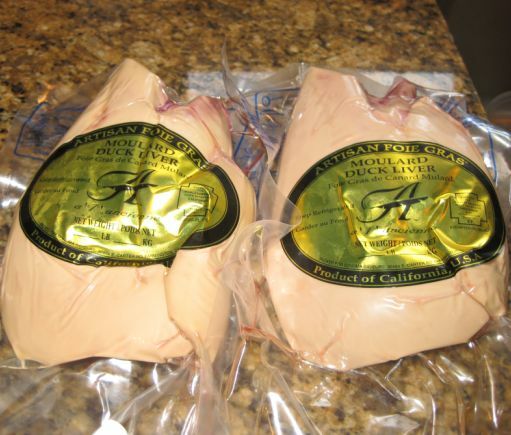 Once the veins are removed the Foie gras is cured with pink salt, kosher salt, and white pepper. Here I am putting the Foie Gras in a container and wrapped it with a plastic wrap and it will be refrigerated and rest for another 24 hours. 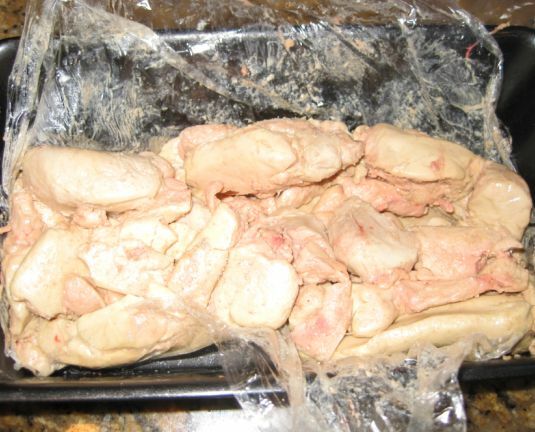 The Foie Gras is removed from the refrigerator and it is put together to shape like a log. 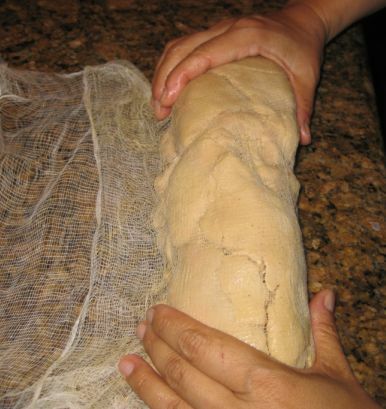 The cheese cloth has to be pulled very strongly so that the Foie Gras is wrap super tight. The end of the cheese cloth are twisted to make it really tight and snug. 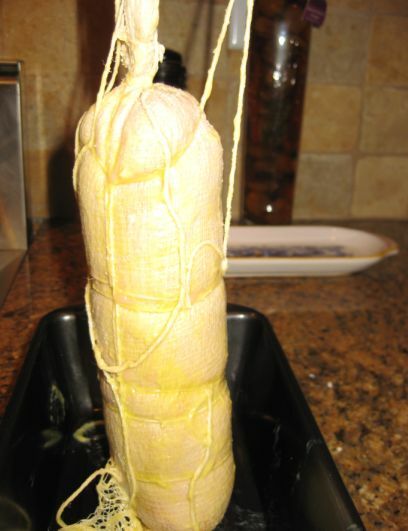 Putting strings around the Foie Gras to hold it together. Chicken broth is brought to a simmer and I am ready to drop the Foie Gras in the broth. I don't have a pot that is large enough and deep enough to submerge the log so what I did is to pour the broth on top of the part of the log that is not in the broth. By the half mark (poaching only takes 90 seconds) I turned the Foie Gras over and left it a bit longer in the broth. Notice that the fat is starting to melt in the broth. 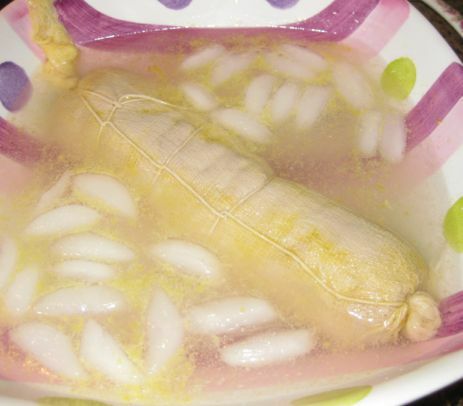 Once it is done poaching, the log is submerge very briefly in an ice cold bath and then it removed. 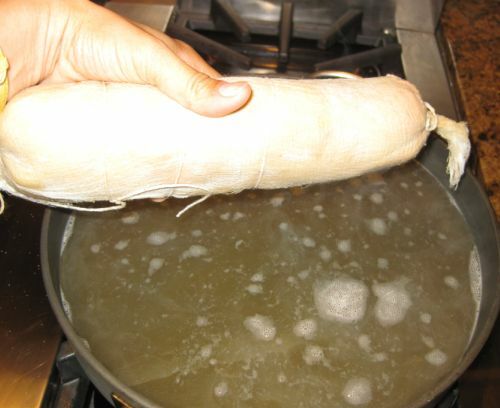 The Foie Gras has lost some volume in the cooking process and must be re-formed by compressing the torchon. 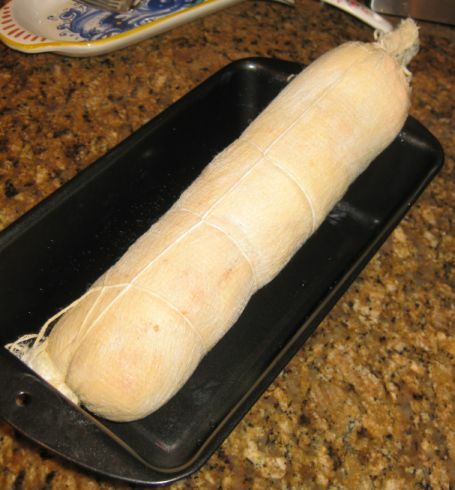 The torchon is reshaped and will go in the refrigerator overnight before it is ready to be served. DAY 4: The Foie gras is ready to be served or can be refrigerated for 7 days. 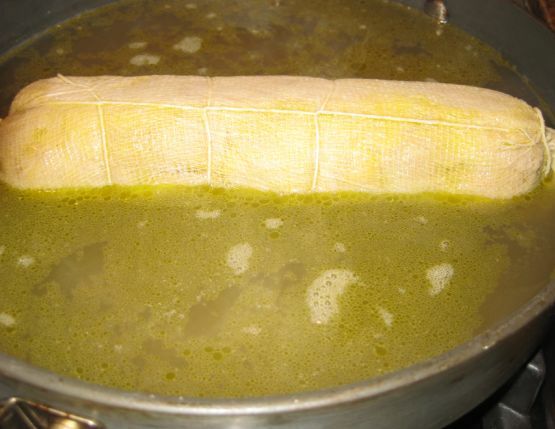 When it is ready to be served, the cheese cloth is removed. 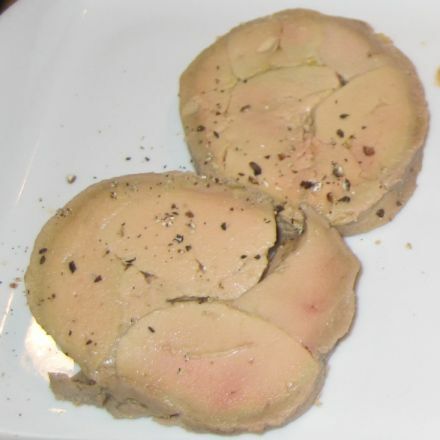 The surface of the Foie Gras is grayish because it was oxidized and I did is to take a knife and just scrape out a thin layer. 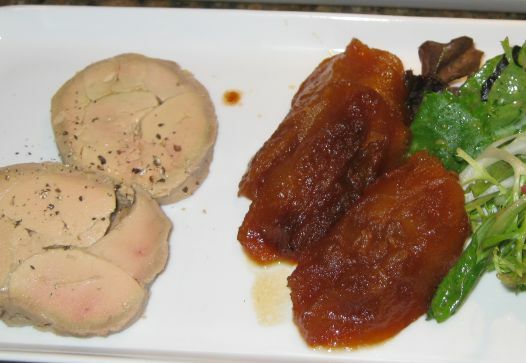 To cut the Foie Gras it is best to run a knife in hot water and then it is will be much easier to slice it.